Hello to everyone out there and welcome to another edition of Mastication Monologues! Today I will be telling you about a little birthday celebration I went to last night in Itaewon that could have ended in gastronomic tragedy, but I managed to tame my own hunger with a little piece of home. One of the girls in my orientation group invited us out to a Moroccan food in Itaewon, the foreigner quarter of Seoul, and naturally I jumped at the chance to eat food I’ve never had before. However, upon arrival, we found out that the restaurant was under renovation, so eventually we found an Egyptian restaurant down the main drag of the area. It was called Ali Baba’s, and I didn’t know really what to expect from Egyptian food since I never tried this type of food either. Upon walking into the establishment, we were greeted with a mostly empty dining room aside from one couple. There were various tchotkes on the walls representing Egypt from plates sporting the iconic King Tut death mask to images of the pyramids at Giza. I was more enjoying the vivacious italo-dance techno beats that were mixed with Middle Eastern rhythms and pumping out the speakers all throughout our dining experience. Upon sitting down, we were served with unleavened flatbread which was not complimentary (1,000 W each piece) and partially undercooked. One of my fellow diners asked our waiter/owner if they could grill the bread to at least make it less soggy, and the waiter said, “It’s fresh. We have an oven”. We took this as, “I have a microwave, so that’s how it is”. This was just the beginning of the terrible service. I ordered the shish taouk (17,000 Won) since I wasn’t quite sure what the meat was going to be roasted on a skewer. We quickly saw that the waiter didn’t know who ordered what, and some people didn’t get their food until everyone else was done eating. Ineptitude aside, my food was served to me in a semi-attractive arrangement with fresh greens, two tomato slices, and two cucumber slices. However, upon tucking into the dish, I was quite disappointed. The pieces of chicken were succulent but not very flavorful. I feel that I could have had the same thing if I stayed at home and cooked boneless chicken breasts in my oven-less kitchen. 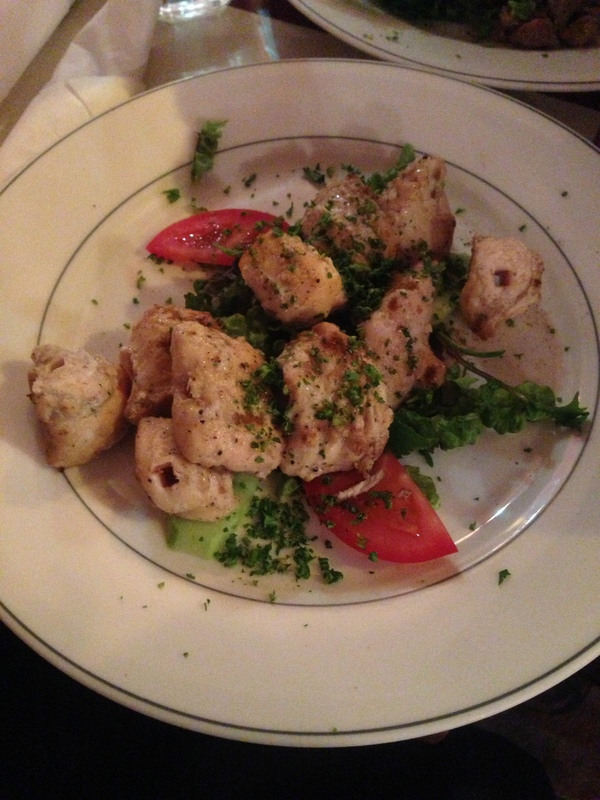 Shish taouk is traditionally served with rice, tabbouleh, garlic sauce, tomato sauce, or fries. None of this was present. Hence I felt the price did not reflect the quality of the meal. The worst part was the fact that the waiter/owner took pictures of us while eating. It was not only intrusive, but a terrible PR trick to make it seem like his restaurant is better than it really is. If you want good Middle Eastern food in Itaewon, look elsewhere because Ali Baba’s is run by one thief. 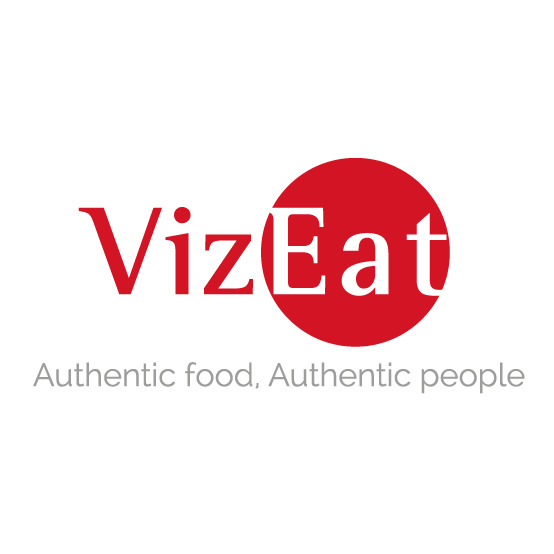 High prices for mediocre food? No thank you. After that meal, a couple of my friends and I decided to go to Taco Bell. Why? 1. 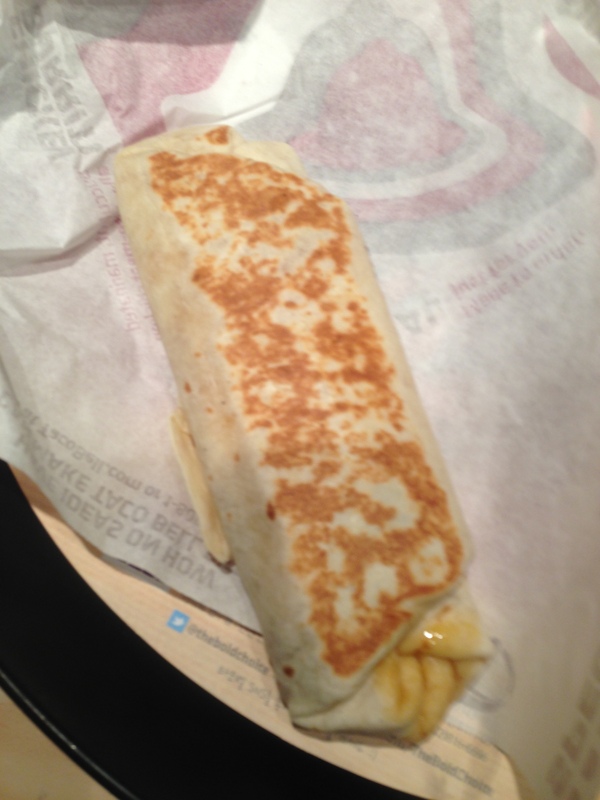 Taco Bell is amazing back home, and 2. I want to see how it’s different in Korea. Even though it’s by a mosque, this is my mecca. Even thought the menu is a bit smaller in terms of choices in comparison to back home, I ordered a grilled bulgogi burrito (3,500 w) and a fiesta bulgogi taco (2,700 w). It was totally worth it. I just find it funny how Korea adapts almost every Western chain by just stuffing bulgogi in everything. Not that I’m complaining though. The grilled bulgogi burrito was moderately sized and was piping hot. Like a newborn in swaddling clothes. The tortilla was very strong and held in all of the contents from the first bite to the meat juice-filled end. It was an interesting mix of delicious cheddar cheese, spicy Korean rice, onions, tomatoes, and sweet marinated beef. It was even better with a liberal spritzing of my favorite Fire sauce that seemed a bit spicier than its American counterpart. As for the fiesta bulgogi taco, it wasn’t that spectacular. 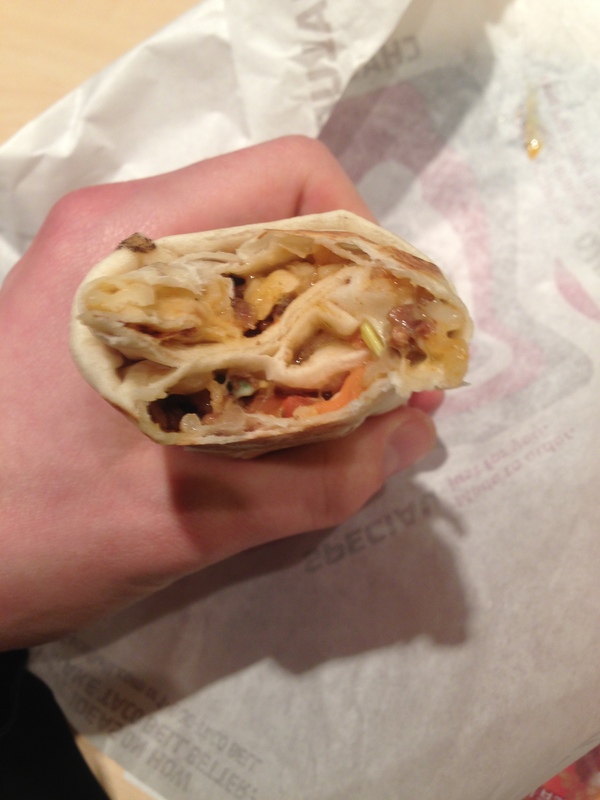 It was like eating a taco supreme without sour cream (beef, lettuce, cheese, and tomatoes). That Korean twist of flavor was seemingly absent in the taco regardless of the bulgogi. This latter meal was not only more satisfying in terms of flavor and quantity, but the sad thing is that the total bill for my four friends and I at Taco Bell was equal to the price of one entree at Ali Baba’s. 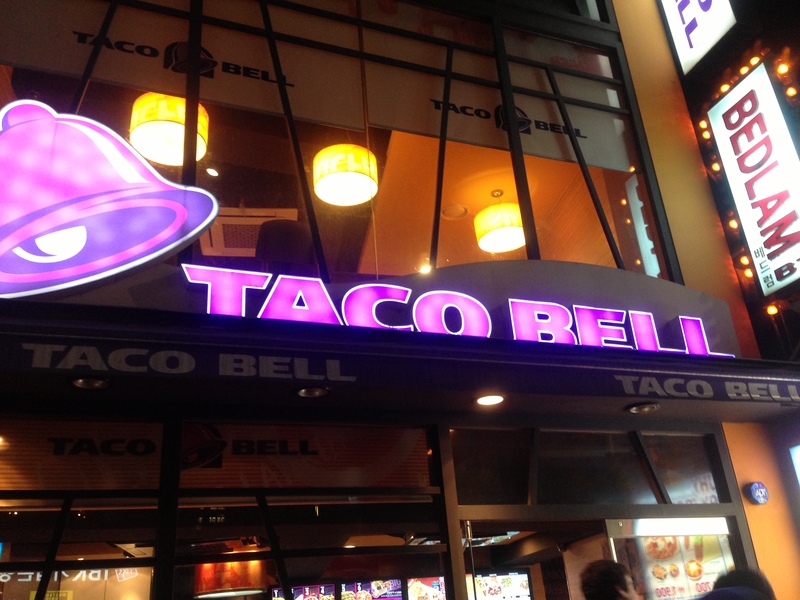 Moral of the story: Don’t trust places named after famous thieves and just go to Taco Bell. Posted in African Cuisine, American Cuisine, Chain Restaurants, Egyptian, Fast Food, Latin American Cuisine, Middle Eastern/Mediterranean Cuisine, Tex Mex and tagged authentic, beef, bread, bulgogi, burrito, cheese, chicken, cucumber, dining, Food, grill, hot, hot sauce, Korea, latin, restaurant, Reviews, rice, salsa, sauce, shish taouk, spicy, taco, tomato. Bookmark the permalink.